A voice of a girl from Thailand has been heard in one of the adult World events. This voice belongs to Ms. Sasima or Gib, 17, a member of the youth group whom they called themselves “Khongjiam Save Girl & Betty Group”. Created by AAT, this youth group from Ubon Ratchathani province have been carrying out activities to prevent human trafficking in their communities, schools and at the border where high rate of migration occur. 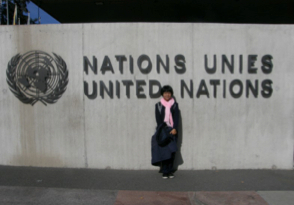 On 28th of September, Gib was selected as one of the two kids to speak out at the UN event, the Day of General Discussion of Committee of the Rights of the Child, in Geneva, Switzerland. She presented the situation and gave the recommendations to the meeting floor. 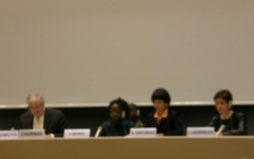 Gib illustrated the vulnerability of stateless children and stated that that any child should have nationality. Moreover, she spoke about the condition of children in detention whom should be treated as children and separated from adults. Also, Gib stated that adults should make sure that children who are travelling are safe and protected. Now, Gib is back in school. She has a lot to tell her friends and teachers. This is such a great experience for her. And we would like to thank Save the Children UK who created this huge opportunity for her and the youth group. We do hope that their voices will be heard and they can have safe spaces in this world! The Day of General Discussion is an annual event which takes place in September each year by the UN Committee of the Rights of the Child. The objective of the conference is to give the recommendations to the member governments in order that they can implement or take action to protect children. Each year the Committee set the topic for this annual meeting. They first started the discussion in 1992. Up until now, there are several topic discussed such as Children in armed conflicts, the rights of indigenous children. Today, the theme of this year is ‘International Migration’ which is in accordance to the trend of Children On The Move. The above article first appeared in Alliance Anti Trafic Flash News.